Julie Lara Kahn graduated from Harvard with an MBA and a BA in East Asian Studies. She has worked as a disc jockey in Japan, an investment banker at Morgan Stanley, an A&R administrator at Columbia Records, and a freelance producer for Annie Leibovitz. She draws on these corporate experiences to raise questions about how marketing and consumption replace our authentic stories with manufactured corporate narratives -- ultimately affecting our sense of connectedness, community and identity. For the past two decades, I have been creating interdisciplinary artworks that cross and re-cross boundaries among visual art, performance, social engineering, and mass marketing. I design elaborate productions involving covert and overt audience interaction which not only create extended portraits of people and places but also nurture community through participation. Although there are invariably artifacts and aesthetic ephemera resulting from each project, the heart of my work is interpersonal dynamics, social criticism and examination of the extraordinary side of ordinary life. My projects often involve years of planning and execution, and I believe my artwork is as much about this process as it is either the intricate participatory events that accompany each work or the objects that remain after the opening. Because I am interested in examining the artistic process while simultaneously making work about broader contemporary issues, my projects also invariably layer some aspect of the art world into the discussion and increasingly incorporate an unexpected encounter between the art world and the larger world. 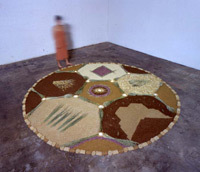 For example, in 2001 at Dorsch Gallery in Miami, I created Got Milk?, which involved a cereal tasting at the gallery, interviews with gallery visitors about childhood breakfast table memories, and a 12' organic multi-grained mandala that I constructed on the gallery floor. The following year I invited 100 Miami art world personalities to provide me with personal information for a deck of art world trading cards, titled OPEN SEASON miami , which I packaged and sold by way of cigarette girls during that year's Art Basel Miami Beach. Most recently, for the past two years I immersed myself in the life of Florida Crackers in order to understand and create a portrait of this important rural subculture -- people with increasingly rare, generations-long ties to the land. The resulting exhibition, Swamp Cabbage, entailed a show of large-scale color photographs, sound, video projections, and a panel discussion with scholars at Locust Projects Gallery accompanied by a wild game tasting at the nearby Food Culture Museum, where crowds from all corners of Miami sampled dishes such as: swamp cabbage, quail in wine sauce, venison & wild hog sausage chili, fried catfish & alligator tail, and soft-shell turtle stew, all harvested from the wilderness and prepared by Cracker families. My largest purpose is to break down the traditional barrier between artwork and onlooker by inviting the viewer into the creative process. I have accomplished this not only by working with the usual windows into the unknown--photographs, videos, and sound installations--but also by offering a taste of a childhood food, an opportunity to break bread with strangers, an environment conducive to unexpected interactions, and a chance to exchange opinions with scholars and people from diverse walks of life. In this way I hope to make discoveries on my own about what distinguishes us and what binds us together, and to share these discoveries by way of community, the land, and the food chain.